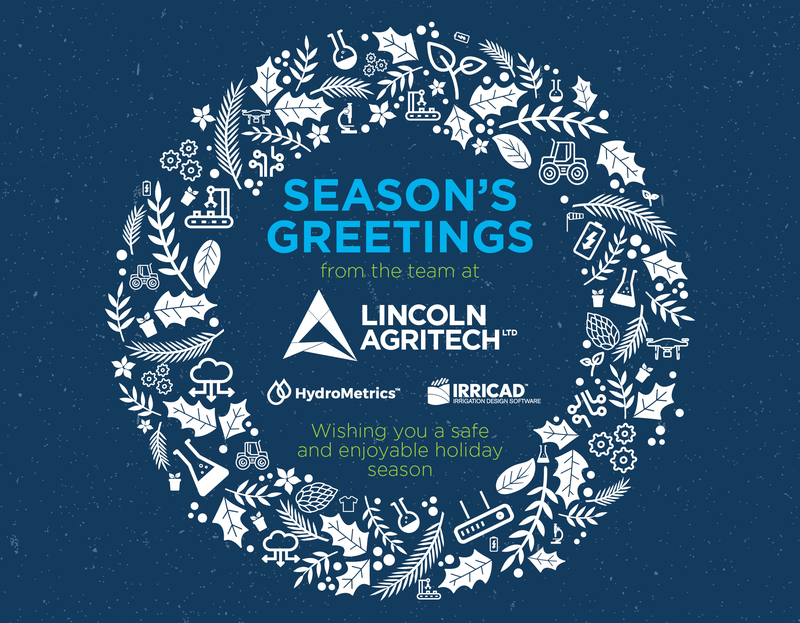 As we near the end of 2018, I can reflect on what has been a tremendous year for Lincoln Agritech Ltd (LAL). We are a small organisation but we fulfil an important role in the NZ research ecosystem. Our expertise in science and engineering research for agriculture, industry and the environment is crucial to NZ’s future success. We have had many highlights this year and I would like to share a few. We had an excellent Ministry of Business, Innovation and Employment (MBIE) round, securing $13.8M of research funding through the highly contested Endeavour Investment Fund in two new five-year programmes. Pleasingly, we were also invited to participate in several MBIE bids from other organisations, four of which were successful and secured LAL an additional $3.4M in subcontracts. It is one thing to be successful in the MBIE bidding process where we compete with all of NZ’s CRIs, universities and independent research organisations. It is another thing to deliver the work. We were delighted to be awarded our first GOLD rating from MBIE for our annual report for the Grape Yield Analyser programme that reports on our delivery over the past 12 months. Locally, we won the ChristchurchNZ Innovation section of the Westpac Champion Canterbury Business Awards. It was particularly pleasing to have the regional community recognise our innovation efforts. As a research company we try hard to be business friendly and assist businesses to solve real world problems and so it was great to be recognised for this by the business community. Our spin out company, CertusBio, made great progress this year in trialling the lactose detection device with a large dairy company. In addition it closed a $250k convertible note capital raise. Dr Matthew Jones, CEO of CertusBio, has been announced as a finalist in the Investment Ready category at the evokeAG Pitch Tent Competition to be held in Melbourne next year. Our work with the wool industry continues to progress well with significant engagement with entrepreneurial companies making high value products from wool. To support the commercialisation of new products being generated by our research efforts, LAL has invested in pilot plant wool processing facilities in order to scale up batch sizes from lab scale to big sample sizes; this will enable partnering companies to incorporate and send samples to international customers. We increased our engagement with Māori in our research programmes and one of the highlights of the year for me was travelling to Minginui to attend the opening of a research laboratory that LAL has established at the Ngāti Whare nursery in Minginui. We will work with Ngāti Whare to look for new and novel Trichoderma in the Whirinaki forest and to upskill the local community in lab techniques to screen Trichoderma, as well as using novel strains of Trichoderma found there to increase their nursery plant growth. Our staff also visited a local marae at Taumutu where we learned of the fascinating history of this marae and the significance of Te Waihora in their history and trade. We increased our collaboration with China, signing two Memorandum of Understandings (MOU) this year. The first was with NATESC, a branch of the Chinese Ministry of Agriculture and Rural Affairs, with whom we had previously signed an MOU in 2016. The second was with the Ecology Institute of Shandong Academy of Sciences to cooperate in microbiology and biotechnology projects. We launched a new IRRICAD website and produced some promotional videos. This follows last year’s refresh of the brand and release of IRRICAD link, an AutoCAD compatible version of IRRICAD. IRRICAD remains popular in the market with the second year in a row of record sales achieved in 2018. Staff member, Brian Moorhead, has been awarded the L.C. Blakemore Award by the NZ Soil Science Society. This is awarded every second year for outstanding performance in soil science technical support. Many thanks to our clients for your continued support, we look forward to working with you again in the new year. I would like to thank the Board for their guidance and support, and the staff for their hard work, talent and dedication. Lincoln Agritech staff – you rock! Ge Wang (NATESC Deputy Director General) signs the MOU agreement with Peter Barrowclough (Lincoln Agritech CEO). Lincoln Agritech recently hosted senior officials from the Chinese National Agro-Technical Extension and Service Centre (NATESC), a division of the Chinese Ministry of Agriculture and Rural Affairs (MARA), (12th - 18th December). The visiting delegation included Mr Wang Ge (Deputy Director-General of NATESC), Mr Du Sen (Division Chief, Division of Water Saving Agriculture), Mrs Zhong Yonghong (Senior Agronomist, Division of Water Saving Agriculture), Mr Mi Changhong and Mr Lin Dasong (Associate Research Fellows, Agro-Environmental Protection Institute). The meeting builds on a relationship that was confirmed in June 2016 when the two parties signed a “Sino-NZ Technical Cooperation on Water-Saving Agriculture” agreement. This agreement was renewed on the 15th November at Lincoln University. Lincoln Agritech and NATESC’s goal is: to develop water-saving agricultural tools; improve efficiency of water and fertiliser use; buffer constraints in water resource shortage; and facilitate sustainable agriculture by implementing technology exchange in research areas such as soil moisture monitoring, smarter irrigation, fertigation, dryland farming and soil and water conservation. 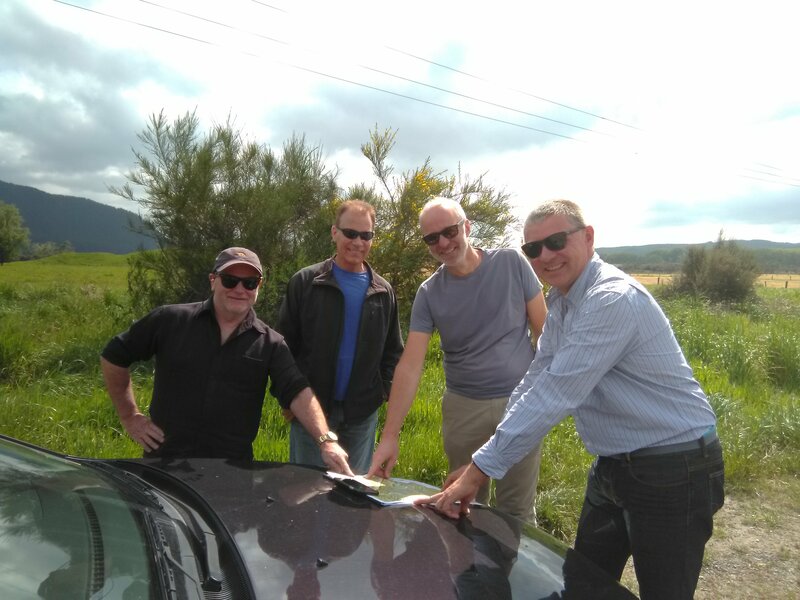 Lincoln Agritech staff members, Peter Barrowclough (CEO), Dean Williamson (Business Development Manager) and Zheng Wang (China Business Development Manager) travelled with the group throughout NZ looking at horticultural production and precision irrigation technologies. 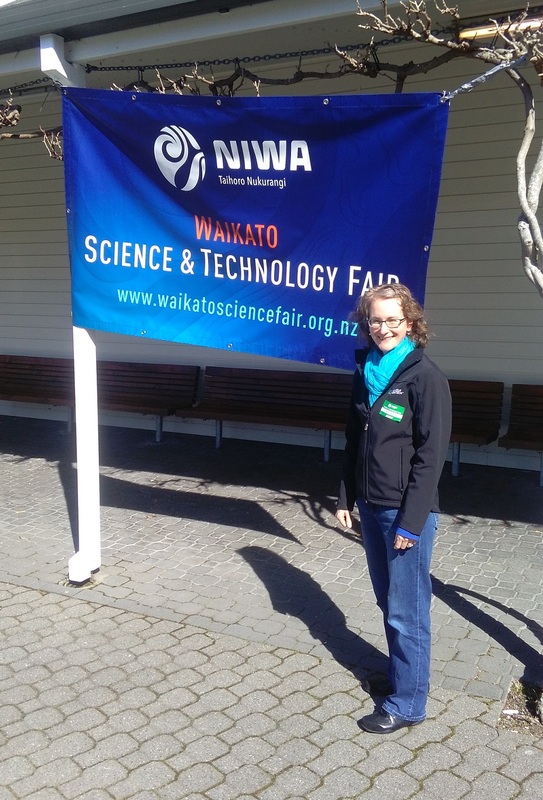 The delegation visited various locations including Mission Estate Winery, Villa Maria’s Twyford Gravels Vineyard, a Mr Apple orchard with a representative from NZ Apple & Pears , NZ’s top producing avocado orchard with representatives from NZ Avocado, Bay Gold kiwifruit orchard, Ashley Dene research farm, Kowhai Farm exhibiting the latest Internet of Things (IoT) technologies, the NZ-China Water Research Centre at Lincoln University, and the NZ Agricultural Show. 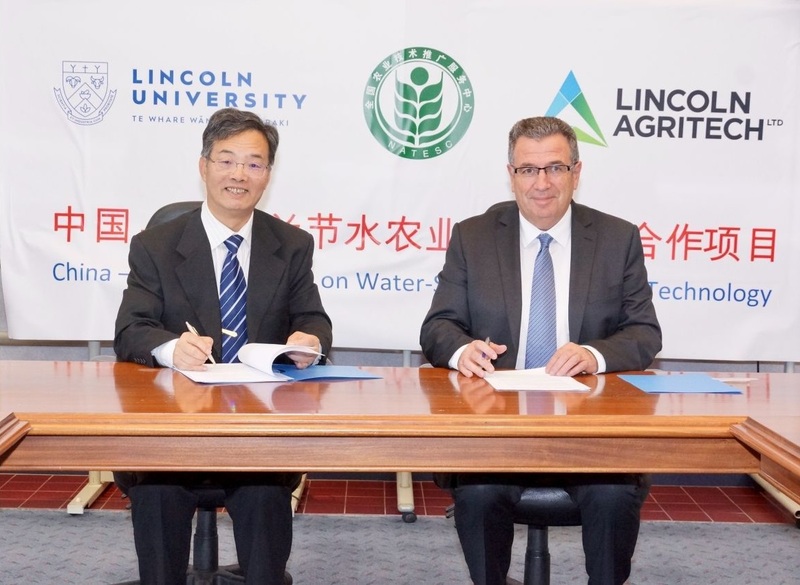 Lincoln Agritech gave presentations on two commercial products sold by the company in China - IRRICAD irrigation design software and HydroMetrics groundwater optical nitrate sensor. This session was also attended by Alan Townsend (Lincoln Agritech Board Member), Kevin Hurren (Director of the Lincoln University Research Office), and Lincoln Agritech staff members Blair Miller (Group Manager Environmental Research), Sophie Rebbeck (Group Manager Business Development and Marketing), and Phil Dewar (Group Manager IT). We would like to thank everyone who was involved in this programme; your cooperation and availability was much appreciated. Lincoln Agritech is leading a five year Ministry of Business, Innovation and Employment (MBIE) funded research programme, ‘Bacterial-fungal hybrid endophytes for nitrogen-fixation and stress tolerance in pine and ryegrass’. We signed an agreement with Ngāti Whare for collection and intellectual property (IP) sharing and have also established a BioDiscovery Unit at their nursery at Minginui. Last month, over 100 people attended the opening of the Unit. Local kaumātua, Mr Tuahai Iraia, blessed and officially opened the lab and the tauira (students) at Te Kura Toitu o Te Whaiti-nui-a-Toi supported their kaumātua. Minginui is already the site of a collaboration between SCION, the CRI for forestry, and Ngāti Whare Holdings using cutting edge technology to grow native podocarps such as tōtara, rimu and kahikatea. Dr Richard Weld, Lincoln Agritech’s Biotechnology Team Manager, leads the MBIE research programme and says “We are seeking revolutionary ways of using naturally-occurring bacteria and fungi to produce nitrogen fixing trees and grasses, and to produce stress tolerant plants”. If successful Lincoln Agritech will work to license these fungal endophyte hybrids to commercial companies. Peter Barrowclough, CEO, in his speech outlined the benefits of the lab, not only in helping to produce healthier, stronger seedlings but in other areas, including education saying “It (the lab) may provide not only a resource for skills development for those that work here, but it may become a teaching resource for whānau enrolled at the kura/school”. 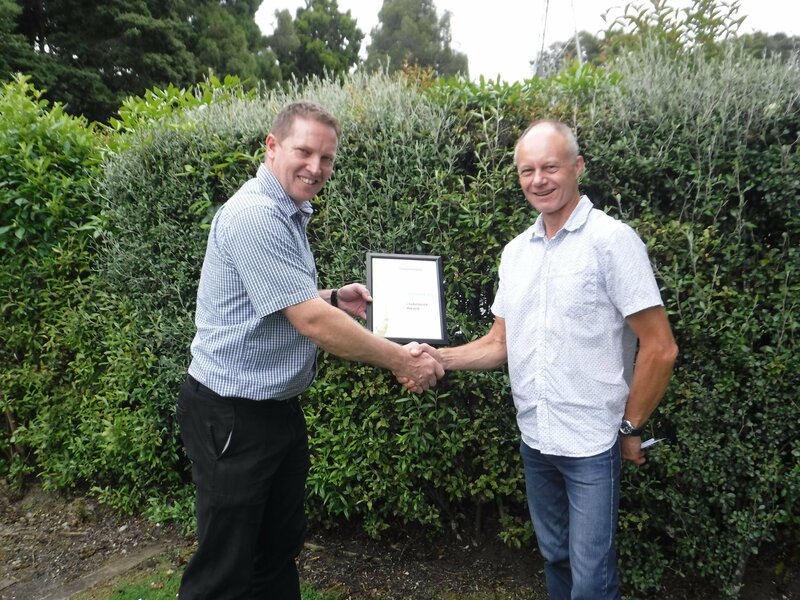 Brian Moorhead, staff member in our Hamilton office, was recently awarded the prestigious NZ Society of Soil Science L.C. Blakemore Award. This award is presented only once every two years and recognises outstanding achievement and performance in soil science technical support. Dave Houlbrooke, immediate past-president of the NZ Soil Science Society, presented Brian the award. Brian Moorhead joined Lincoln Agritech in 2000 and has made tremendous contributions to various projects on optimising agricultural/horticultural land use and minimising negative environmental effects. He has provided outstanding technical support and managed large scale operations for numerous projects on the hydrology and nutrient dynamics in the soil – vadose zone – groundwater continuum. Soil coring, sampling, stream flow gauging, streambed sampling, groundwater and stream sampling and GPS applications are just a few of Brian’s many invaluable contributions to our field site investigations. Lincoln Agritech hosted the 20th Australasian Conference on Robotics and Automation, the first time it has been held in the South Island. It was attended by about 75 delegates, predominately from NZ and Australia with some from further afield. An impressive range of initiatives and activities were presented with many in the agricultural and environmental space. Lincoln Agritech makes a 'major scientific breakthrough' by deconstructing coarse wool fibres into cellular components; creating potential novel materials for the cosmetics, filters and luxury clothing industries. This research programme is being co-funded by Ministry of Business, Innovation and Employment (MBIE) and Wool Research Organisation of New Zealand (WRONZ). Read more here. From left to right: Dr. Greg Barkle (Aqualinc), Dr. Mike Friedel (Lincoln Agritech), Prof. Esben Auken (Aarhus University), and Dr. Roland Stenger (Lincoln Agritech). Lincoln Agritech is leading the Critical Pathways research programme funded by the Ministry of Business, Innovation and Employment (MBIE). This five-year research programme aims to unravel the sub-catchment scale nitrogen delivery to waterways. Recently Lincoln Agritech’s groundwater researchers had the opportunity to host Professor Esben Auken (Aarhus University, Denmark), one of their international collaborators. Together the team visited the Waiotapu Stream catchment located on the North Island’s Central Plateau. The Waiotapu Stream catchment is one of the two pilot catchments where Lincoln Agritech will be conducting geophysical studies in early 2019. Using technology pioneered by Professor Auken and his colleagues, a helicopter-borne geophysical survey of the area will be undertaken. These surveys have been designed to improve our understandings of the structural, hydrological, and chemical properties of the subsurface environment that control water and contaminant fluxes. From the Mariu, Grace, Toka, and Puru whānau of Ngāti Tūwharetoa, Waikato, Ngāti Whātua and Te Aupōuri, Dione Payne is married to Matiu Payne (Kāi Tahu, Ngāti Mutunga, Ngāti Kinohaku) and has three sons, Tre, Tūrāhui and Tāne. They live in Koukourarata (Port Levy). Dione graduated with a PhD from Victoria University in 2013 having completed an analysis of Māori land and confiscation in the 1960s in rural Waikato. Subsequently, she took up the role as Academic Director with Kiwa Insitute of Education in Auckland. Prior to this, Dione had a varied and high profile career including roles at Te Wananga o Aotearoa, NZQA, Manukau District Court, Turuki Healthcare and the Ministry of Foreign Affairs and Trade where she served as Diplomat to Fiji and Tuvalu. Dione shares an avid interest in Māori land development and economics, mahingka kai, and apiculture all of which are included as part of her whānau 100 year plan entitled “Mā ngā mokopuna – for the grandchildren”. In addition to her directorship role at Lincoln Agritech, Dionne leads the Māori relationships and strategy portfolio and is part of the senior management team at Lincoln University. New label keywords and more! Check out IRRICAD version 17 here. Copyright © 2018 Lincoln Agritech, All rights reserved.